RWRC’s Bi-National Day of Action this Saturday! El Paso, Tx – The Retail Workers Rights Committee (RWRC), the Labor Justice Committee (CJL) in El Paso, and the Southwest Workers Union (SWU) in San Antonio, TX will be combining forces to protest against Family Dollar Stores this Saturday as part of the RWRC’s Family Dollar isn’t Family Friendly Campaign. The RWRC has recently expanded its organizing efforts to Juarez, Mexico and San Antonio, TX. “Expanding our organizing efforts is necessary in order to inform the public about the company’s repeated abuses of its workers” said Abel Lopez, RWRC member. He added “It is especially important to inform citizens of Juarez, given that much of the stores customers who shop in El Paso live in Juarez. Abel Lopez was a busy man. The El Paso resident’s job with Family Dollar, Inc. averaged 60-80 hours a week. A former graphic designer and ad man from neighboring Ciudad Juarez, Mexico, Lopez spent his days unloading trucks, processing freight, scouring toilets, running cash registers, cleaning, shelving, changing prices, doing inventory, and covering for other employees. As a bonus, he was even held up by armed robbers. Family Dollar is one of a growing group of chain-store corporations that cater to America’s poor by selling cheap goods, many imported from sweatshops in low-wage countries including China and Mexico. Critics of the two largest dollar store chains, Family Dollar and Dollar General, contend that the companies extract super-profits from the uncompensated labor of overworked store “managers” and other employees. At the root of employee complaints against Family Dollar, Dollar General, and other retail chains is a somewhat archaic Fair Labor Standards Act passed in the 1930s. The Act came about when “mom-and-pop” establishments and not “mega-corporations” were the norm, said Karen Dulaney Smith, owner of the KDS Consulting labor-management firm in Austin, Texas. Exemptions for retail managers and others under the FLSA set the stage for a wider assault on overtime and the 40-hour workweek. Long backed by the U.S. Chamber of Commerce and other business associations, the Bush administration’s Department of Labor (DOL) attempted to expand overtime exemptions in 2003 to cover more than 8 million additional workers, according to an analysis prepared by the Washington. D.C.-based Economic Policy Institute (EPI). Adopted in 2004, softened but still expanded overtime exemption rules affected about 6 million new workers, Eisenbrey estimated. Chefs, sous chefs, nursery school teachers, mortgage loan officers, media workers, and others were suddenly handed “promotions” that bumped up their status from lowly, hourly workers. At the same time it was relaxing overtime requirements, the Bush administration quietly gutted the DOL’s wage and hour law enforcement capabilities by simply not filling a large number of positions after employees retired, said Dulaney Smith, who worked as a DOL investigator between 1987 and 1999. A report from the Brennan Center for Justice found that the number of DOL wage and hour investigators dropped from 921 in 1975 to 788 in 2004, while the number of workers who received back wages fell from 380,254 to 288,296 in the same time frame. Just Pay report documented rampant overtime violations. The study cited a 2008 survey of 4,387 workers in New York, Chicago, and Los Angeles that reported workers were cheated out of approximately $56.4 million in wages every week in the three cities alone. Not only do family budgets suffer from the wage theft, but so do local economies and tax bases, the report noted. Last April, after more than seven years on the job, Abel Lopez was fired. Family Dollar blamed him – unjustly, the worker says — for bad upkeep of the store. 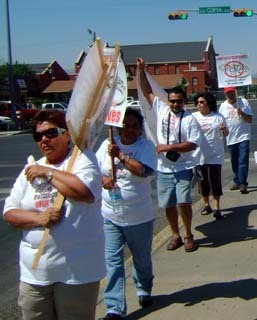 Recently, he and a small group of supporters conducted roving pickets at different Family Dollar stores in El Paso. One day he stood outside a store wearing a t-shirt that read: “Family Dollar: Exploited Manager,” while an El Paso police officer warned the group not to leaflet on company premises. “We’re being misclassified as store managers to avoid paying overtime,” Lopez charged. “I think the profit is made out of the hours they don’t pay the managers. …They give you a payroll, and actually most of the time the payroll doesn’t cover you,” Lopez said, adding that managers were forced to do the jobs of workers they could not afford to staff. Pay for Family Dollar managers like Lopez starts off around $550 per week but the long hours required result in some employees barely earning above minimum wage, Lopez says. At the opposite end of the company’s income spectrum, Family Dollar CEO Howard Levine enjoyed an annual compensation package of $5.38 million in 2010–part of a five-year bundle valued at $14 million, according to Forbes. Based in North Carolina, Family Dollar began in 1959 with one store in Charlotte. More than 40 years later, the chain has more than 6,700 stores in 44 states with 45,000 employees. Earning nearly $7.9 billion in revenues for fiscal year 2010, Family Dollar recorded nine consecutive quarters of double-digit earnings per share growth through the summer of this year. The chain “significantly expanded operating margins and improved inventory productivity” while continuing to return “excess cash” to its shareholders, according to a company statement. As the months dragged on, Lopez waged a battle on two fronts: out on the streets and inside state unemployment offices, there he eventually prevailed against Family Dollar’s initial rejection of his claim, he said. Abel Lopez is not the first company manager to challenge the Tennessee-based retailer. In 2006, more than 1,400 former and current company managers won an Alabama lawsuit alleging FLSA overtime violations and seeking compensation. Agreeing with the plaintiffs, a federal jury ordered the company to pay $35.6 million. Family Dollar appealed. Family Dollar chairman and CEO Howard Levine praised the hard work of his employees but insisted they were exempt from laws requiring overtime pay. “We believe we are correct in classifying our store managers as salaried managers, and we intend to continue to fight for what we believe is right,” Levine said in a statement. Dollar General faces the same overtime issues as Family Dollar. The “majority of [mangers’] work is the same as hourly employees,” said Gould, an attorney for Beasley-Allen, the Alabama-based law firm that since 2004 has handled thousands of employee complaints against Dollar General. Unlike actual executives, Gould charged, Dollar General’s managers must defer to district bosses for significant decisions. The approximately 750 cases pending in various U.S. courts make overtime lawsuits filed by managers of retail outlets “one of the fastest-growing areas of litigation,” said Gould. True to its name, Dollar Tree does indeed offer mostly very cheap goods. As the night of witches and goblins approached, El Paso shoppers were greeted with a gaudy “Halloween Headquarters” stocked with $1 candy bags, “boneyard” skulls, black crows and other apparitions of faux terror. For a mere buck, borderland children can play at killing with toy assault rifles and grenades, the make-believe images of real-life weapons used every day just across the river in violence-torn Ciudad Juarez, Mexico. They can also pretend to ply the tools of the trade of returning Iraq and Afghanistan war veterans stationed at El Paso’s Fort Bliss in ever increasing numbers. “Dollars may not grow on trees but outlets of Dollar Tree’s stores seem to,” noted Hoover’s. “Customers are responding in record numbers to our outstanding values and fun shopping experience,” said president and CEO Bob Sasser, who presumably also finds fun in a four-year compensation package Forbes estimated at $9.42 million. Filled with the products of the world’s low-wage manufacturing centers, the dollar store industry occupies an economic niche somewhere below Wal-Mart and K-Mart, and somewhat above the weekend garage sale. They fill store fronts in moribund cities and strip malls around the country, as in economically depressed Barre, VT, where a Family Dollar displaying cheap items in bright colors nestles next to a nail emporium, a Chinese restaurant, a basic Radio Shack, and a long-empty storefront. Dollar stores are also fixtures of immigrant communities. 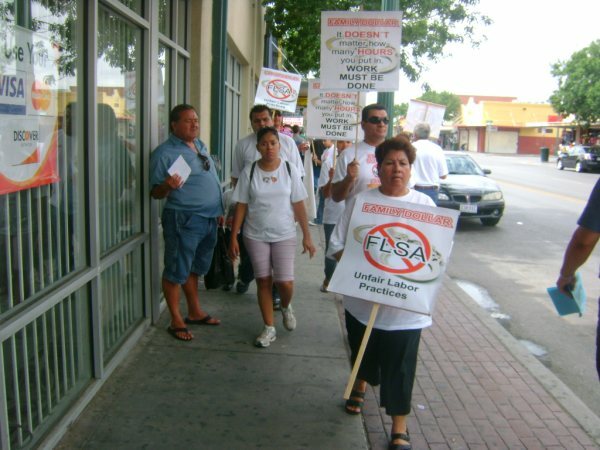 In New Mexico, west Texas and elsewhere it is common to find them near indoor flea markets, pay-day lenders and other manifestations of what Eric Murillo of the El Paso-based Retail Workers Rights Committee (RWRC) called the brave new world of the “predatory economy”. 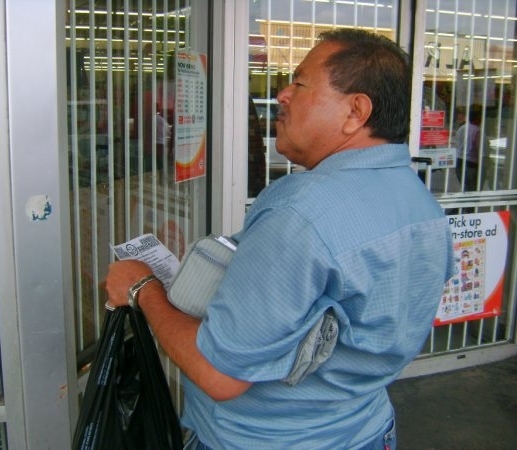 Founder of El Paso’s Border Workers Association, Guillermo Glenn, noted that the Family Dollar battle has special resonance in a city where retail jobs are one of the few options left. After NAFTA and other free trade pacts were implemented, nearly 40,000 manufacturing jobs were demolished in what Glenn termed a Katrina-like economic storm. Ironically, in El Paso’s shops now, gadgets and gizmos made in China and other low-wage havens compete with cheaply produced Mexican goods. If workers’ grievances are as severe as they appear to be, it poses the question of whether retail stores are the sweatshops at the top of the sweatshop chain. Backed by allies from different social movements, the RWRC is planning an October 16th national day of action against Family Dollar in cities such as El Paso and San Antonio. Organizer Eric Murillo said Family Dollar employees across the country were in the same boat. “We feel if we keep this pressure up, we’ll get other Family Dollar workers and perhaps other retail workers involved in this struggle as well,” Murillo said. 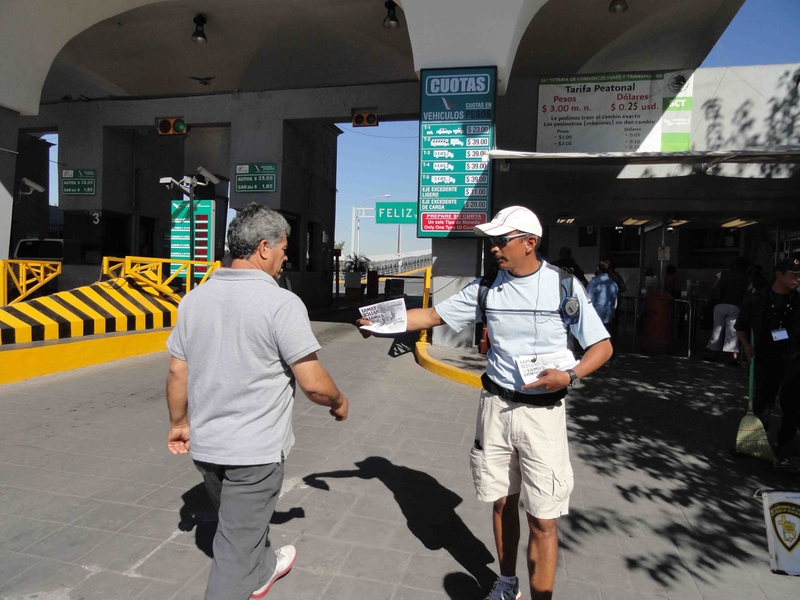 Juarez, Mexico: RWRC members distribute flyers about upcoming National Day of Action. The Family Dollar store in downtown is the biggest earner for El Paso Family Dollar operations. Many of its shoppers are Juarez residents who routinely shop at Family Dollar stores in downtown El Paso. We, the Retail Workers Rights Committee (RWRC) are organizing a campaign against Family Dollar Stores Inc., because of the corporation’s systematic violations of its workers rights. Family Dollar was found guilty of violating the Fair Labor Standards Act (FLSA) in 2006 by a US District court in Alabama. The FLSA is a federal law which establishes minimum requirements for employees’ hours of work, wages, premium overtime and payroll records. The corporation was forced to pay over $35 million to approximately 1200 managers for unpaid overtime. Family Dollar stores promote employees to management positions, where they will only spend approximately 20% of their time on the clock performing managerial duties like scheduling, interviews, and other related tasks. The rest of the time, managers perform manual labor like opening and closing the stores, running the cash registers, stocking and work in the warehouse. Employees classified as managers can work 70-80 hours per week without overtime compensation. This is a clear violation of the FLSA, and Family Dollar methodically applies this practice in order to avoid paying its managers overtime. Family Dollar management often threatens and harasses employees who question company practices. The job market in El Paso, like many cities across the US is stagnant and jobs are hard to find. The District Manager and General Manager for Family Dollar Stores in El Paso routinely threatened to fire employees who speak out against company abuse. Employees, who have used the company’s procedures to air grievances, have been punished. In addition to facing unfair working conditions, Family Dollar store employees have been assaulted, robbed, and harassed while on the clock by customers and area residents. Many employees fear that the company has more interest in protecting its merchandise than its workforce. RWRC members are asking that the company provide a safe working environment by hiring security in stores with high crime areas. The Retail Workers Rights Committee demands that Family Dollar Corporation stop violating the Fair Labor Standards Act, and respect workers rights. 1. Family Dollar Stores should stop misclassifying employees as managers in order to avoid paying overtime. 2. Workers grievances must be heard without fear of retaliation. Management must allow for employees to talk about work related issues without the threat of being fired for speaking up. Workers must also be allowed to organize freely, without fear of retaliation. 3. Family Dollar must protect the companies most important resource; its workers. Security must be provided for its workers. 4. Compensation or reinstatement should be provided for staff who have been unjustly fired. Reinstated staff should not face retaliatory actions upon return. The company, which has seen a 4th-quarter revenue raise, sells allegedly low-cost products but its failure to pay its employees appropriate wages harms communities rather than help them. Retail store employees are often underpaid and as a result, they are reliant on government aid which drains public resources. 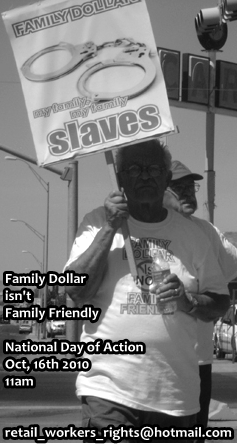 We are asking that our friends and allies support us on our national day of action against Family Dollar Stores Inc. There are 6, 785 Family Dollar stores in 44 states. We will be protesting outside of Family Dollar stores across the nation on October the 16th, 2010 at 11am. Supporting organizations and individuals who are not able to make the protests are asked to contact Family Dollar Corporate offices during the week of October 11-15th in support of our campaign demands. Leave a message for CEO Howard Levine. Let Mr. Levine know that you support the RWRC demands! Ultimately, this campaign is for the end of exploitative tactics against workers everywhere. The undersigned organizations support the Retail Workers Rights Committee in its march for justice for Family Dollar employees. 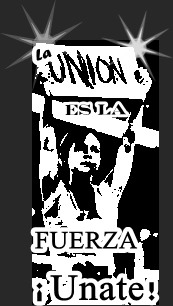 ¡La union hace la fuerza! a national day of action against Family Dollar Stores nationwide. The Retail Workers Rights Committee and its allies will be planning a national day of action against Family Dollar Stores. The national day of action will feature coordinated demonstrations in several major US cities. For more information on the day of action email us at retail_workers_rights@hotmail.com. The national day of action will involve grassroots organizations, workers centers, labor unions, and other social justice advocates. Decenas de ex trabajadores de la cadena Family Dollar volvieron a manifestarse, ayer sábado, por las presuntas violaciones de sus derechos, robos de sueldos y presiones psicológicas de las que han sido objeto por parte de directivos de esa compañía. Las protestas, que iniciaron a las 10:00 a.m., tuvieron por escenario la tienda ubicada en el número 500 de la calle Piedras, a la altura de la I-10, en la zona Central de la ciudad. “Queremos que se nos unan las personas que han sido despedidas por decir la verdad y que juntos demandemos nuestros derechos”, dijo, Abel López. Las acciones fueron apoyadas por miembros del Comité de Derechos de los Trabajadores de Ventas al Menudeo, el Comité de Justicia Laboral y activistas de diversas organizaciones derechohumanistas locales. Justice can’t wait! Protest Family Dollar stores this Saturday! El Paso, TX – Members of the Retail Workers Rights Committee, the Labor Justice Committee, and other community activists and supporters will be picketing outside of a Family Dollar store in Central El Paso this Saturday. The RWRC and its allies are organizing area workers who have faced workplace abuse, wage theft, and other related workplace issues. Currently, the “Family Dollar isn’t Family Friendly” campaign is focused on getting more local support for former and current Family Dollar managers who are misclassified in order for the corporation to avoid paying overtime. I would like the people that had been fired like me to speak out, to demand their rights! 1. Why are you protesting against Family Dollar? Because we want the customers and the workers to know that the way they run business is wrong, the way they treat employees is a violation of the Fair Labor Standard Act. It is the best example of how store managers are being exploited and the way the company it’s making money and becoming more successful. 2. What was your job/position there? I was a Store Manager just by title. I used to sweep, mop, unload trailers between 1100 – 1500 cases per week, stock merchandise, clean restrooms, even unclog toilets, clean warehouse, sweep parking lot, received outside vendors, clean windows, actually I was more like a maintenance person instead of manager, my job was more cleaning, stocking, and other manual functions compared to office duties that where actually 2 hours in the morning to count money, go to the bank, do paperwork, opening and closing the store, do deposits, and the hiring process. I intreviewed people only when I was in the need of an employee, not a daily task. I would say 80% of my job was manual activity and 20% office work. I worked at Family Dollar for 7 years and 6 months. 4. How many hours a week did you work? My average work week was 60 hours to 80 hours and sometimes up to 90 hours per week. 5. Why were you fired? Supposedly because of store conditions, my District Manager Brenda Valenzuela told me to go on vacations before I got fired, and that when I returned I needed to figure a way to empty my warehouse. She mentioned that my performance as manager was good along with my sales even with having a full warehouse. My sales were always improving. I was above of what I was asked. My sales floor wasn’t a problem, it was always fully stocked, recovered and in shape. The problem was the warehouse, but if I got fired because of this, I know other managers that have this same problem and haven’t been fired like me. 6. What do you want from this campaign? I would like the people that had been fired like me to speak out, to demand their rights. I want for Family Dollar to stop intimidating employees, to change its labor practices , and to change the way they treat employees and to stop overworking managers! 7. What is your message for other Family Dollar employees? I know it’s hard for them to speak out, to join us, but I understand that they are with me, not to risk their position, but to talk. There is someone on above everyone. If they don’t get answers do not stop trying until someone does something. If that doesn’t happened do not hesitate to contact us, together we can make things happened and get better results! 8. What is your message for other retail workers? Unfortunately we don’t see anything wrong when they (companies) let us work, when no one bothers you, but your time is money. Why will you be working so many hours unpaid for a company when you will probably end up like me (fired)? Work and take care of your job but don’t let anyone treat you bad. No one needs to be yelled at, threated, denigrated, etc. Make sure you are being treated and payed the way everyone deserves. If you are not, reach out to the RWRC and get involved in the fight for workers rights! 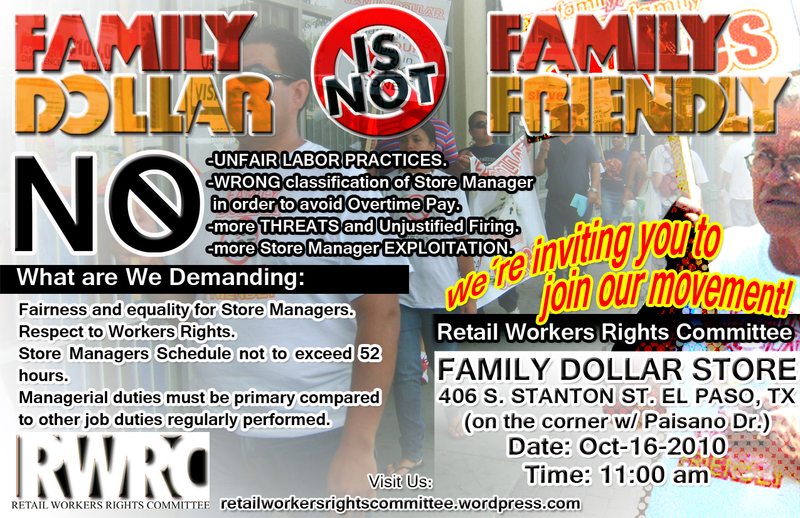 Retail Workers Rights Committee will protest outside of Family Dollar store this Saturday! The Retail Workers Rights Committee (RWRC) will be protesting this Saturday as part of the “Family Dollar isn’t Fair” campaign. Members of the RWRC, el Comité de Justicia Laboral (CJL), and other local activists and labor supporters will be demanding that Family Dollar stop exploiting it’s workforce. Come join us this Saturday at Family Dollar on 500 N Piedras St. at 10 am.